We are excited to offer several optional additions to your 2019 vegetable CSA share this season. These options are all sourced from other farms in the local community, because while we’d love to do it all, we’d rather focus on the craft of growing great veggies and let our neighbors take care of the rest. The easiest thing to do is select the options on your CSA registration form when you sign up. You can also always add something later if you change your mind. In 2019 we will be partnering with Glorie Farm in Marlboro for the optional fruit share. Glorie specializes in exclusively tree fruit (think crisp heirloom apples, bosc and bartlett pears, sweet white and yellow peaches and nectarines, etc). As such, the fruit share is only for 14 weeks, starting in late July and running through the end of the CSA. Late July is the start of the tree fruit harvest season, so starting then means we’ll be getting the freshest just-picked fruit out there. Glorie uses IPM practices to manage their sustainably-grown orchard. For all you “fun guys” out there, we’ll be offering a mushroom share option from Wiltbank Mushroom Farm in Catskill. Farmer Gary Wiltbank grows Shitake and Oyster mushrooms, and the 1-quart shares will generally alternate between the two. The ten mushroom distributions will be spread out over the CSA season, allowing for some flexibility in production, particularly during the hottest part of the season. We will give mushroom share participants advanced notice of when to expect their mushroom share. We’re excited to be connected with Tree Juice Maple Syrup, of Lazy Crazy Acres Farm in Arkville, nestled in the Catskill Moutains. They offer a one-time distribution of maple syrup in the late Spring that we’ll be passing on to any interested CSA members – prices are $30 for a half gallon or $50 for a full gallon. That’s a lot of fresh, local syrup that should last a very long time! We’re partnering this season with Sea Change Farm and Flower to offer weekly flower bouquets. The flower CSA runs June-September (4 months), and you can choose to join for that entire period or by the month. Sea Change is a new, small, woman-run flower farm in Stone Ridge, NY. Their sustainably-grown fresh flowers change with the seasons, from poppies, snapdragons, and anemones in late spring, to zinnias, cosmos, and sunflowers in high summer, through to dahlias and chrysanthemums come fall. The hand-picked CSA bouquets will feature a delightful blend of whatever is blooming each week. Bring the beauty of the moment inside to grace your table! Similar to the maple syrup, we’ll be offering a one-time distribution of local wildflower honey from Damn Good Honey Farm in Kerhonkson. Local honey has a number of excellent health benefits (including helping with seasonal allergies), on top of being delicious, so we’re excited to be partnering with Keith and Jennifer Duarte of Damn Good Honey to offer this one-time distribution. This year we’re going to partner with Chaseholm Farm to host their monthly buying club in the Kingston area. Chaseholm is a third-generation organic, grass-fed dairy operation in Pine Plains. Once a month, you can pre-order from their array of cheese, yogurt, pork, and beef and pick it up at CSA pick-up. Since you’ll be ordering each week, there’s no need to sign up ahead of time for this add-on – we’ll merely email the entire CSA membership when it’s time to order. 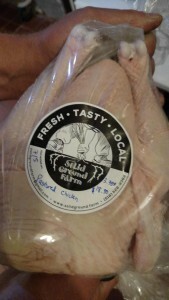 Chicken: We also have fresh chicken raised on-farm available for sale four times over the course of the season. We pasture-raise our Freedom Ranger birds, and feed them non-GMO feed. We will give advance notice of upcoming chicken availability before our processing days – chickens are available to all, although priority is given to our veggie CSA members.